01: Now What? - House and Cuddy are exploring the ramifications of those feelings and attempting to make a real relationship work. Meanwhile, due to a colleague's illness, Princeton Plainsboro is left without a neurosurgeon on site, threatening the hospital's accreditation as a Level 1 Trauma Center. As the team attempts treatment to get their sick colleague back to work, they discover there is more to the illness than they originally suspected and turn to House for direction. Instead, House remains elusive, leaving the team on its own. 02: Selfish - When Della, a seemingly healthy and active 14-year-old, suddenly collapses during a skateboarding exhibition, House and his team struggle to diagnose her condition and reassure her parents who already have to cope with their son's terminal illness. After her body rejects a donor lung, and with time running out to save her life, Della's family is left with little hope of securing a new donor and faced with a seemingly impossible decision regarding the fate of both children. 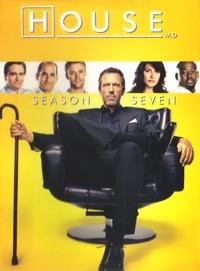 Meanwhile, House tries to appease an elderly father and his son at the clinic, and House and Cuddy begin to face the challenges of taking their romantic relationship into the workplace. 03: Unwritten - When Alice, the author of a popular children's book series, inexplicably suffers from a seizure moments before an attempt to take her own life, the Princeton Plansboro team faces the challenges of evaluating both her underlying medical conditions, as well as her unstable psychological state. Unable to diagnose Alice, House becomes particularly motivated, as he's a fan of her books, and is convinced that the key to unlocking the mysteries of Alice's condition lies in the pages of her most recent novel. Meanwhile, House takes Cuddy on a double date with Wilson and his girlfriend, Sam, and makes a discovery that proves that life imitates art as the couple continues to make compromises in order to make their relationship work. 04: Massage Therapy - When a patient named Margaret McPherson is admitted to Princeton Plainsboro after suffering severe and uncontrollable vomiting, House and the team make unexpected discoveries about her identity as they assess her symptoms. When the symptoms don't improve, the team looks to the patient's medical history to unearth more about her past. Meanwhile, House gives Chase's new hire a cold welcome, and a visit from House's massage therapist forces House and Cuddy to confront the reservations in their relationship.